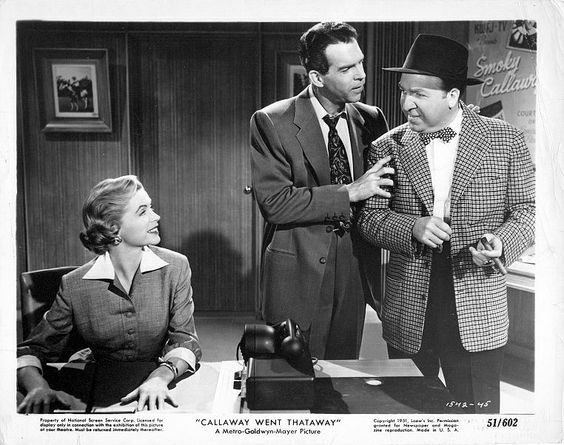 Today, I'm reviewing the comedy Callaway Went Thataway (1951). 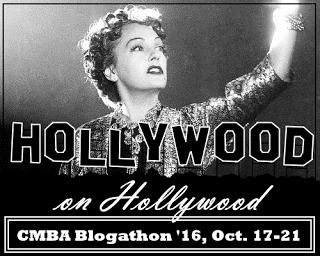 This article is part of the Classic Movie Blog Association's 2016 fall blogathon, Hollywood on Hollywood. There are a lot of old Hollywood movies about making movies, but movies about how TV impacted the film industry are not all that common. 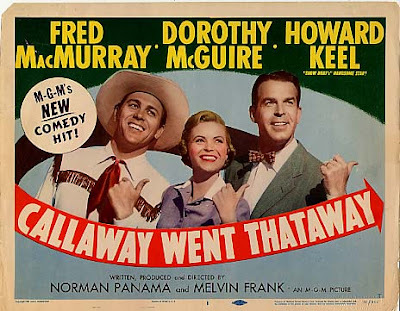 The comedy Callaway Went Thataway (1951) is a spoof of the early fifties cowboy craze starring Fred MacMurray and Dorothy McGuire as two advertising executives on the make, and Howard Keel in a double role as a washed-up Westerns star and his pure-hearted look alike. When Callaway Went Thataway begins, advertisers Mike Frye (MacMurray) and Deborah Patterson (McGuire) are raking in the cash by showing old Smoky Callaway (Keel) Westerns on TV. Children across America are mesmerized by Smoky's feats of derring-do, and Smoky endorsed products are flying off the store shelves. The show's sponsor (Fay Roope) decides to produce a new TV series starring Smoky, but no one knows what became of the boozing star since he went on a bender several years ago. Out of desperation, Frye and Patterson drag a reluctant lookalike (also played by Keel) from a Colorado ranch to Hollywood so he can replace the missing Smoky. Callaway Went Thataway was written, directed, and produced by the team of Melvin Frank and Norman Panama, who were responsible for such crowd-pleasing hits as Mr. Blandings Builds His Dream House (1948), White Christmas (1954), and The Court Jester (1956). While Frank and Panama aim their satire at several targets, including the greediness of the advertising industry -- Frye has Smoky endorse everything from breakfast cereal to girdles -- and the public personas of movie stars -- Smoky plays a noble hero on screen, but in real life he is a nasty, womanizing drunk -- their main target was TV. In 1951, TV was in its infancy, but it was already a powerful force in the entertainment industry. Studios like MGM, which produced Callaway Went Thataway, were losing profits to the new medium as audiences opted to tune into their newfangled sets instead of going to the movies. TV also renewed the stardom of actors who had run their course in movies (Loretta Young, Lucille Ball), and gave opportunities to entertainers who hadn't yet earned a studio contract (Jerry Lewis and Dean Martin were a popular nightclub act until TV made them superstars). In fact, in the latter part of the decade, TV roles became an important stepping stone to movie stardom for actors like Steve McQueen, Angie Dickinson, and James Garner. Dorothy McGuire, Fred MacMurray, and Jesse White in a lobby card for Callaway Went Thataway (1951). Thanks to Keel's rich baritone, Smoky is somewhat reminiscent of singing cowboys like Roy Rogers and Gene Autry, but Callaway Went Thataway is mostly based on William Boyd, aka Hopalong Cassidy. Boyd made a series of movies from the mid-1930s to the mid-1940s as the cowboy hero who fought crime in the old West while drinking nothing harder than the occasional sarsaparilla. The movie series had mostly run its course by the end of World War II, but the ever-canny Boyd, who was a shrewd businessman, bought the rights to the Hopalong character and the old Hopalong movies. Boyd then formed his own production company and quickly began churning out movies that could be easily serialized on TV. NBC snapped up the rights, and Hopalong became a national craze, especially among children. Boyd was one of TV's first superstars, and a bonanza of Hopalong merchandise soon followed including trading cards, comic books, and cowboy outfits. 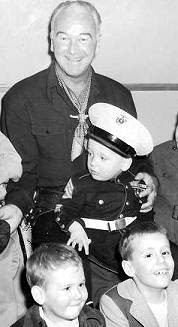 William Boyd visits some Chicago Hopalong fans in this 1950 photo. Hopalong Cassidy is mostly a trivia item today, but that doesn't make Callaway Went Thataway any less enjoyable. The three leads are all outstanding. McGuire looks lovely as the sensible Deborah and MacMurray expertly handles several great one-liners with his razor sharp comic timing, but it is Keel, a relative newcomer to Hollywood at the time, who gives the performance of the film. He handles two very different roles with aplomb, putting on a big grin and a soft spoken demeanor to play the lovable Stretch and memorably boozing it up as the loud and lecherous Smoky. Callaway Went Thataway also features cameos from big MGM stars like Elizabeth Taylor, Esther Williams, and Clark Gable (pre-code star Mae Clarke also has a bit part as a mother of some young Smoky fans), and a fun supporting performance from future Gilligan's Island castaway Natalie Schafer as a man hungry socialite who has an eye for Smoky. Callaway Went Thataway is available on DVD. I grew up in Barnesville, Ohio, which is about 5 miles from Hoppy's birthplace of Belmont. They had a historical marker, which used to cause a lot of amusement/bemusement from visitors. My admiration for Howard Keel increased tenfold when I first saw him in this picture. I can relate to those 1950s kids. I'd give anything if TCM would devote Saturday mornings to "Hoppy". It appears that television, movies and advertising will ever have a stranglehold on the public, doesn't it? I like those old Westerns too. They're just good clean fun. Very cool how Hollywood incorporated TV and also all of those cameos. I'm a sucker for classic Hollywood cameos! This sounds like a fun movie and I can't wait to see it! Poor Esther Williams looks like she was threatened with suspension unless she did her cameo, but they are fun nonetheless. Awesome post and very clever choice for the blogathon. I always kind of avoided this - don't know why - but I do love me some Howard Keel and your review just pushed me to the "I'm in" column! It's a good choice if you like Howard Keel. It really shows off his acting chops. Although I've not gotten into classic TV per se, besides maybe "I Love Lucy" (! ), this film sounds like a total blast -- with the tug-of-war between TV and movies, washed up actors vs. their squeaky clean screen personas, and the western genre, I must see this. Great choice for the blogathon! This sounds like a lot of fun, and it also sounds like it could be as relevant today as it was in the early 1950s. Callaway Went Thataway really paved the way for the sharper TV satires like A Face in the Crowd and Will Success Spoil Rock Hunter? I'm always down for a Mae Clarke bit part, and the movie itself sounds like a hoot! Thanks for contributing! Thanks for all your hard work putting the blogathon together. A sweet movie and a lot of fun. The cast is great. Thanks for remembering this film. I've always liked it. It's not Citizen Kane, but it is an enjoyable, breezy movie. I actually didn't realize it was her until I looked at IMDB after watching the film. I recently watched several Dorothy McGuire movies. I will have to keep an eye out for this one! !